Muhlenbergia Schreb., Gen. Pl. 44. 1789. Annuals or perennials; culms not robust. Blades linear. Inflorescence a panicle. 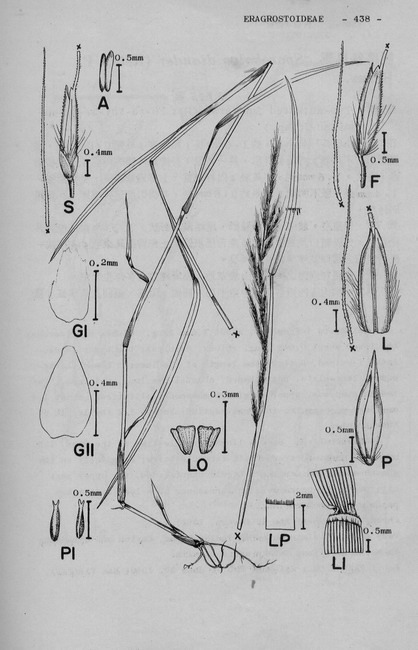 Spikelets narrowly lanceolate, small, 1-flowered, often long-awned; rachilla articulate at base of lemma, not produced; glumes equal or unequal, acute or acuminate, 1-nerved, keeled, thin, persistent; lemmas as long as or longer than glumes, convex-keeled, bearded at base, thin; palea as long as lemma or longer, oblong with 2 nerves, apex attenuate; lodicules 2, small; stamens 3, the anthers short or long; ovary glabrous, the styles 2, free, short, the stigmas plumose, protruding sideways. Caryopsis terete, free. About 100 species distributed from Himalaya to China and Japan, North America and extending to the Andes.